Picked up a copy of The Paybacks #1 from Dark Horse last week on the strength of the ad and the write up in Previews a couple of months ago. And I’m glad I did, too! The basic premise is that being a superhero is expensive and, to pay for all the “wonderful toys” costs money. As we all know, cash is hard to come by these days so heroes will take out loans in order to maintain their lifestyle / obsessive crime-fighting habit. Trouble is, being on the side of the angels isn’t exactly renowned for monetary rewards – these people do it for the warm glow it gives them, right? But if there’s no money coming in, then the loans don’t get repaid which is where The Paybacks come in – “the world’s first and best super-repo team” as the inside cover has it. 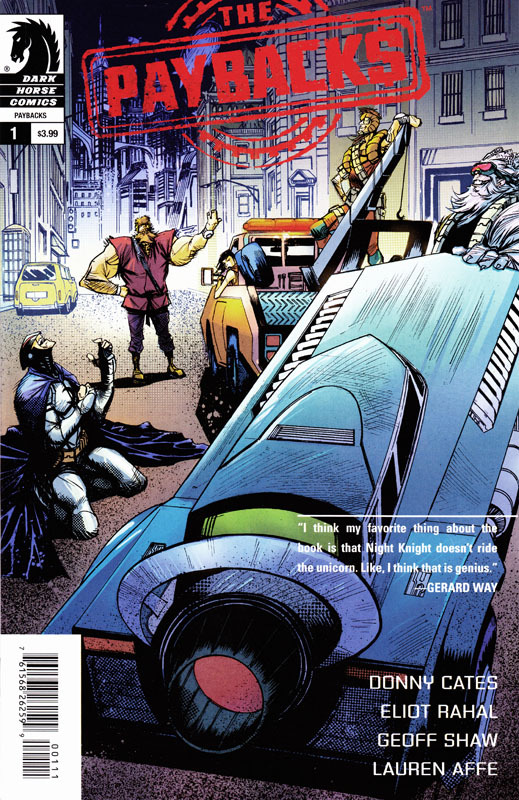 The team is split into two with the first team’s target being the London based Archibald Primrose III, aka Night Knight who has a stately manor (complete with butler) and a cave beneath it stuffed full of gadgets – yeah, they went there. Elsewhere, the remaining members are trying to track down Battery, a key part of the Command, the world’s greatest superhero team. 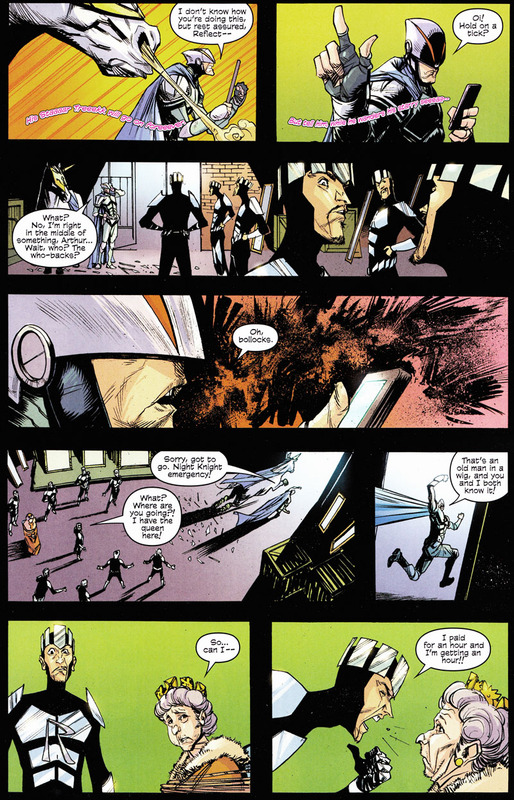 While apprehending the Night Knight (eventually) works out just fine, the mission to get to Battery is less successful with most of the second team’s members being killed off screen before we’ve even met them. Which is a shame as with names like Destroyladon and Sister Mary Frankenstein, I want to know more. The tone of this issue is light with jokes aplenty, both dialogue and visually and, as it’s mostly set up and introduction the characters are mostly broad brush strokes, the mysterious Driver being the one who gets most to do as he links both teams’ stories, but there’s plenty here to entice me to a second and further issues. All in all, a splendid first issue from writers Donny Cates and Eliot Rahal with art by Geoff Shaw, coloured by Lauren Affe. Posted on Monday, September 21, 2015 by GaryPosted in ReviewTagged Paybacks.